Bruce Springsteen and the E Street Band essentially took over Newark last night on their Wrecking Ball tour. To close out the night, they whipped up a truly remarkable rendition of the Band’s iconic “The Weight” in tribute to the late Levon Helm. 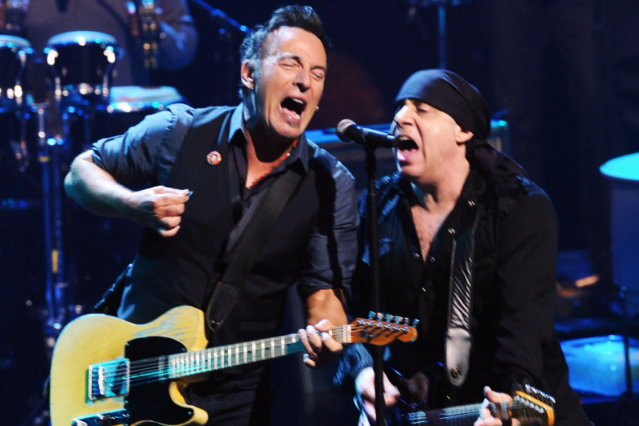 As Consequence of Sound notes, Springsteen and Helm had united in Jersey prior to the latter’s death last month, playing Asbury Park’s infamous Stone Pony club in the mid-1980s. The solemn, unadorned acoustic performance from Springsteen last night was especially amplified by the entire crowd harmonizing with the band, as you can hear in the video below. Springsteen is off to Europe next month (where audiences might not know all the words to “The Weight”), but he’ll be back in August and will tour through September (at least). For the record, we’re still wondering whether Wrecking Ball is a rap record.